The bad news is that the game's title is a lie. The good news is that it's coming out in less than a month. Duels of the Planeswalkers has been a pretty solid hit for Wizards of the Coast, mainly because it's an excellent game so it came as no surprise when a sequel to the game was announced. However, it turns out the new game will actually be used to introduce Magic 2012, the 30th expansion set for the card game. 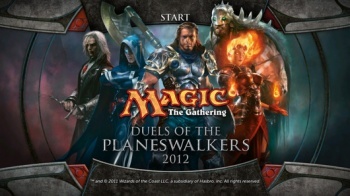 The sequel, Duels of the Planeswalkers 2012, is actually launching a month before the retail release of the expansion comes out: The cards are due out July 15, but Duels of the Planeswalkers 2012 is hitting Xbox Live Arcade, the PlayStation Network, and Steam on June 15.
â€¢ All New Multiplayer Game Mode "Archenemy"
It's also been noted that the each version of the game will give players a different bonus card. Steam users will get a Frost Titan card, XBLA players receive a Grave Titan, and PSN players unlock the Inferno Titan. No price point for the game has been announced yet. Presumably, it'll be somewhere in the range of its predecessor, which is currently selling for 800 MS Points (or $10). UPDATE: Several readers asked if custom deck creation would be an option in Duels of the Plainswalkers 2012. Since I couldn't answer that question, I sent it over to Wizards of the Coast along with an inquiry about how much the game would cost. Here are the answers: The game will cost $10 and Wizards said that "Yes, custom deck creation will be an option."